When I first saw the Fancy Forest quilt from Elizabeth Hartmann I knew it was the right project for a wall hanging to decorate the spare bedroom. First I got the Hazel Hedgehog pattern and made pillow covers for kids in the family. At the Prague Patchwork Meeting I finally found a fabric collection that was the right one to start with the Fancy Forest quilt. The pattern is written very clearly, it is easy to follow. Precise cutting and precise piecing with a 1/4″ allowance is a must. 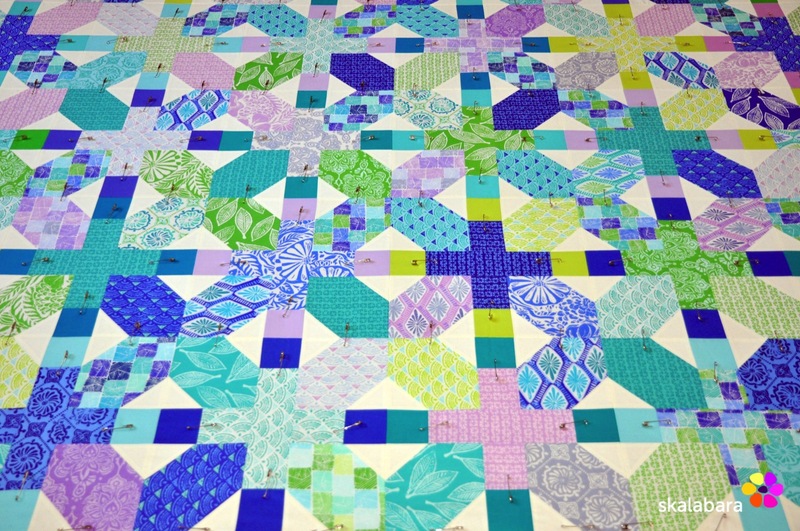 It was fun work and finally I pieced all the blocks needed for the small version of the pattern. 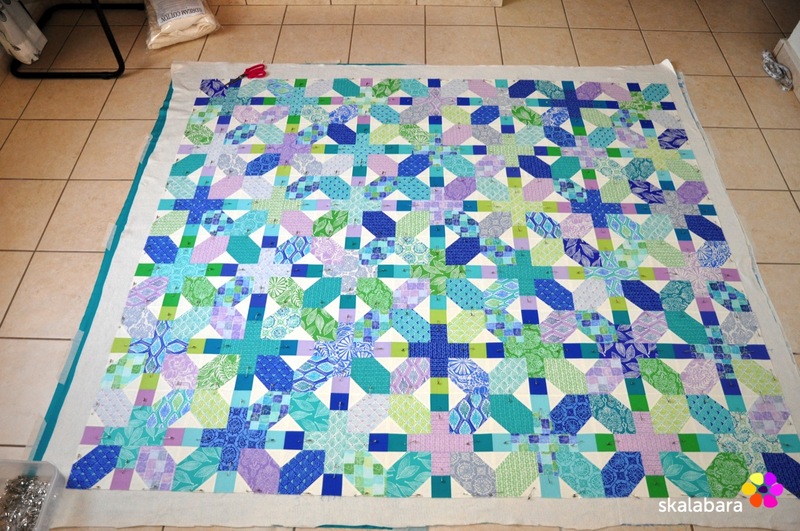 I have added the sashing and the quilt is now prepared for quilting. I wasn’t very precise with cutting and piecing with the upper firefly block and it turned out that it was a 1/4 inch narrower than it was supposed to be. I had to make a new one and changed the colors. I shall make a place mat with this one. 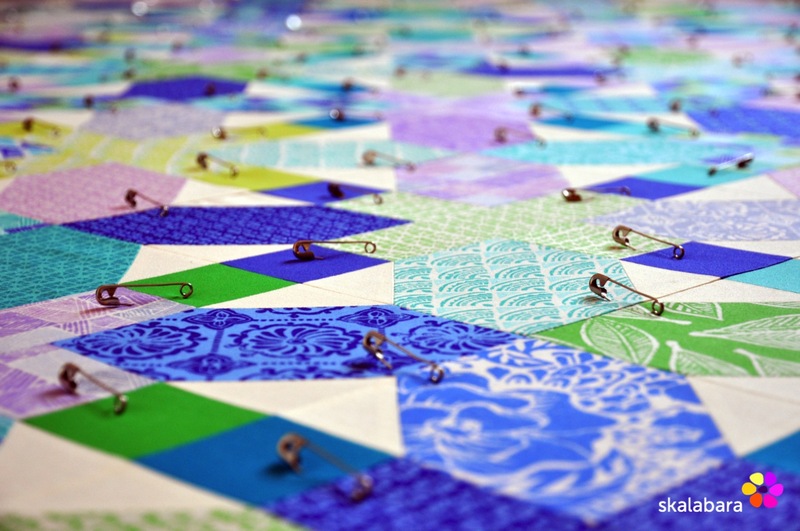 Now it is time to select a backing, make a sandwich and start quilting! A good project for the next week (or maybe weeks). It is exactly a year that I finished the Horizon quilt top. Since then it was waiting on the shelf for further procedure. I had the backing fabrics, but no time to make the sandwich and start quilting. This week I received a bulky parcel from Cottonpatch with a delivery of my favorite wadding : Quilters Dream Cotton Natural Select. So, no more excuses and I started today piecing the backing, got the wadding out of the bag, cleaned the quilt top from loose threads and finally (after a year) made the quilt sandwich. This is what I have on the needles : knitting an easy triangle shawl for cool days in the winter or cool nights in the summer. 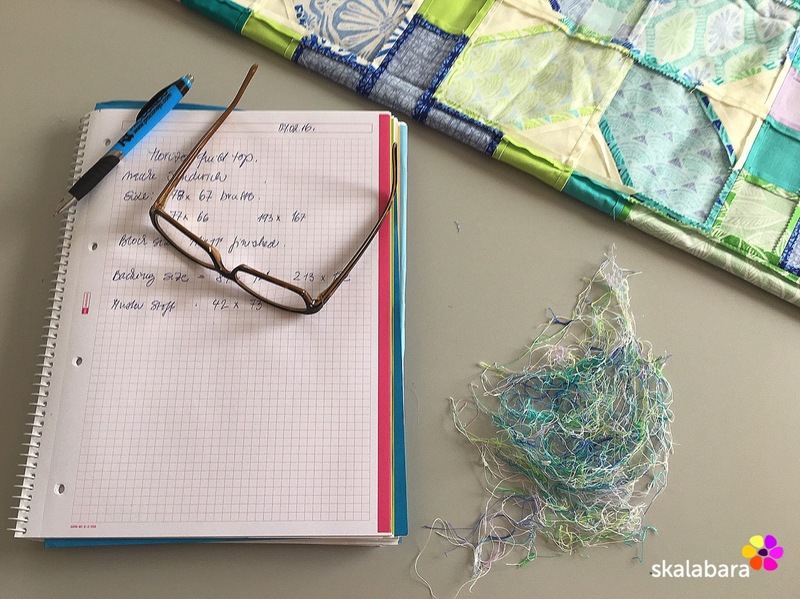 I am using my last – fourth – ball of Drops Kid-Silk and I hope to finish it soon. 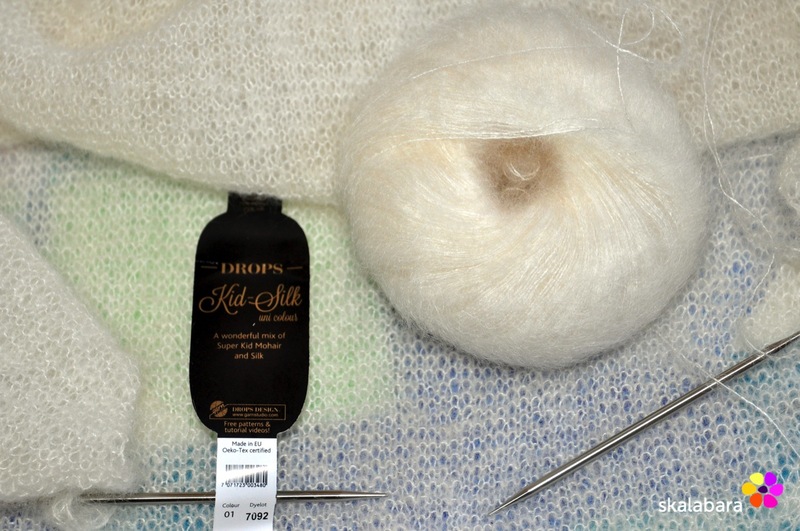 The wool is a dream, at first I had to get used to the very thin wool, but now it’s OK. I am knitting on 47″ red lace circulars from Chiaogoo. The only project that I have finished this week was a set of four chair cushions for my friend Jane. She has redecorated her house, red is her favorite color and she wanted some cushion covers to match her new curtains and table runners. 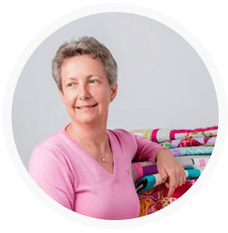 I’ll be linking this week with Lets Bee Social at Sew Fresh Quilts and Needle and Thread Thursday at My Quilt Infatuation. That is all for today, happy quilting! My work life is still a bit hectic, with more appointments as usual, so patchwork is on a hold. But I finally got to start the Skill Builder BOM blocks. 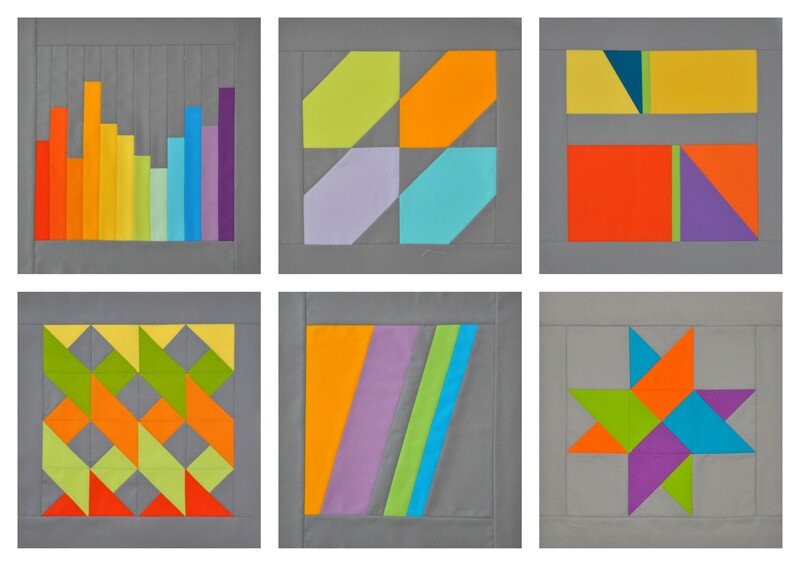 I have pieced the first 6 blocks, haven’t decided yet on the quilting design. I suppose there is no hurry. 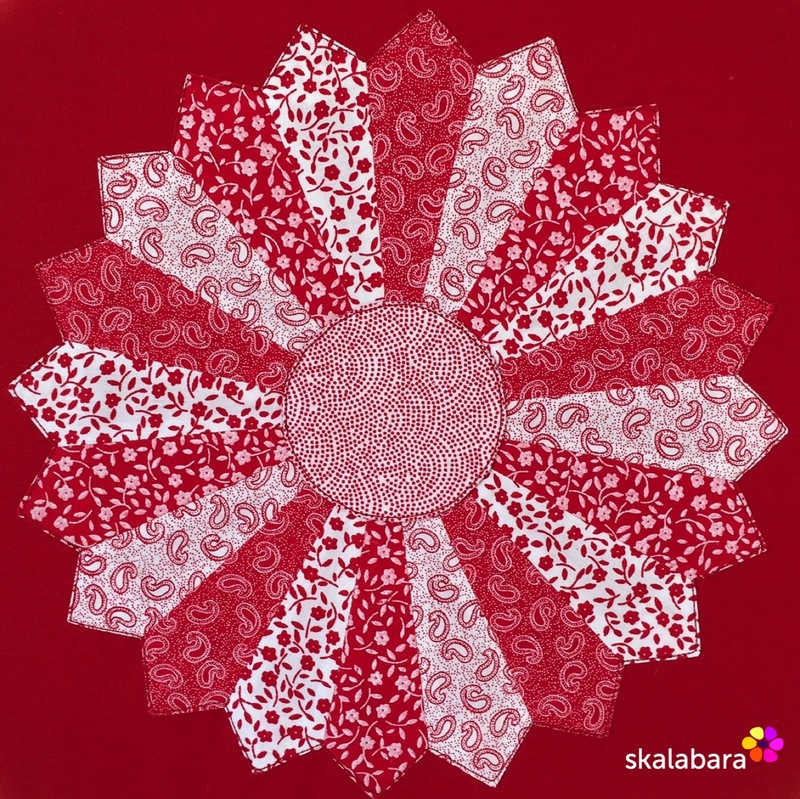 Got the backing fabric – a wonderful flowery design in a rich orange, wadding is waiting on the shelf. 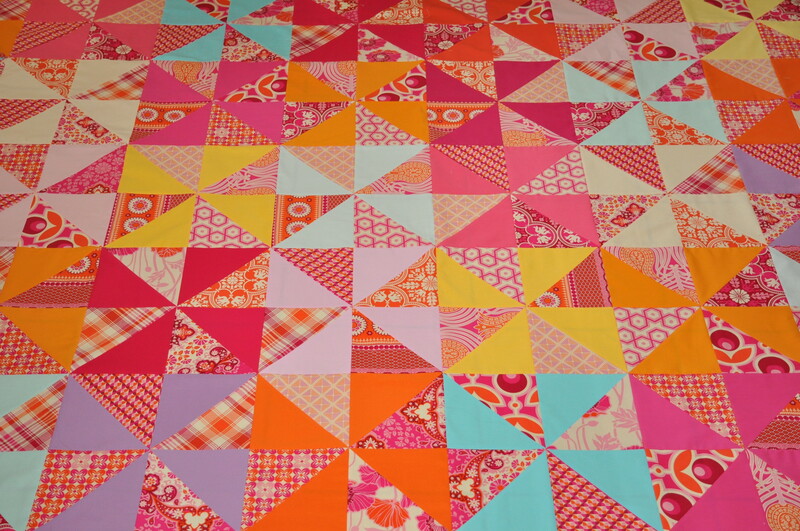 Wednesday is a public holiday, so I shall have time for quilting. Fire and Ice quilt top has sat in the cupboard for a few months. Since it has rained for a few days (very unusual for this time of year), I got it out and made a quilt sandwich. Once more this top has a floral backing fabric – with tulips. 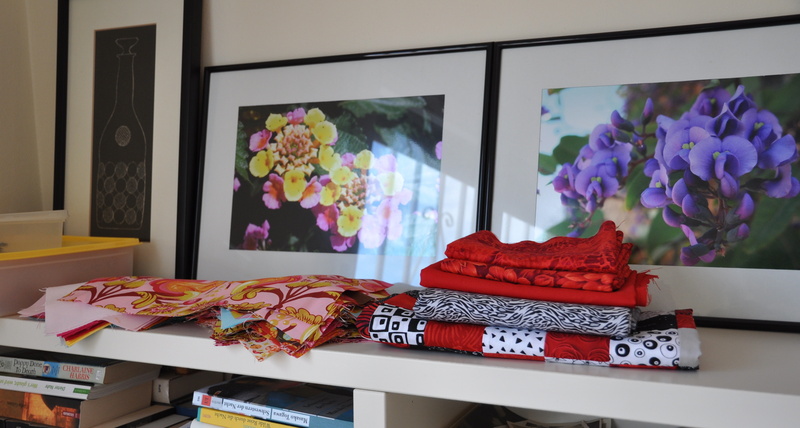 Lots to quilt – my days will be “quilty” busy, looking forward to that. Saturday is normally our shopping day. First we visit the street market in Almoradi, have a nice coffee and a second breakfast in a café bar and then do the grocery shopping in a nearby supermarket. So far so good. We have done the same this Saturday and as we came back at midday the wind grew slowly stronger. And then came a gust – but what a gust. The rain didn’t come down, it was pushed horizontally by the wind. In these 1-2 minutes my husband’s amateur radio antenna came down. 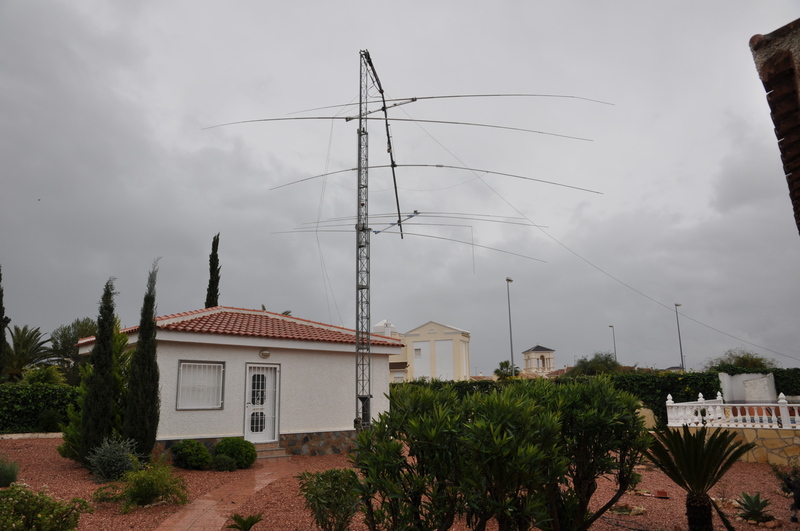 Luckily with help of 2 friends the antenna got sorted out and Helmut can now start with new antenna designs. The tower needs some work, but all is manageable and shall be done next week. 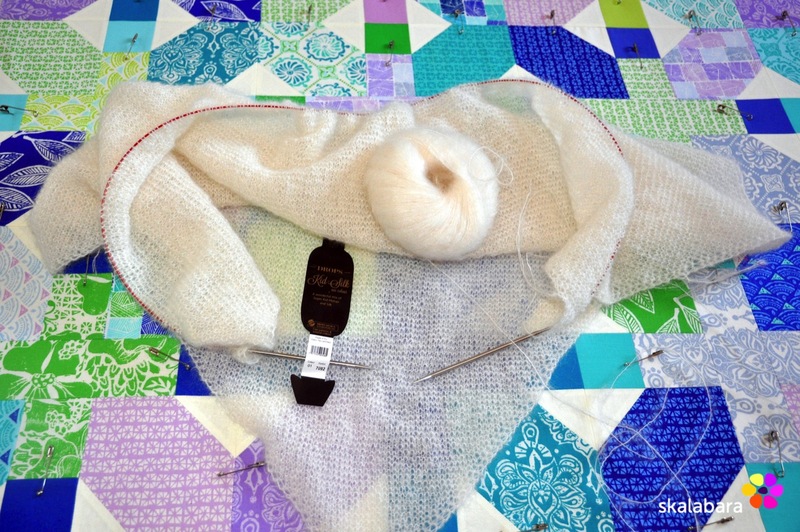 Instead of working on my quilts I helped to clear the antenna “disaster” and did a lot of sweeping around the house. I didn’t know that pine trees can have so many needles that fall down. 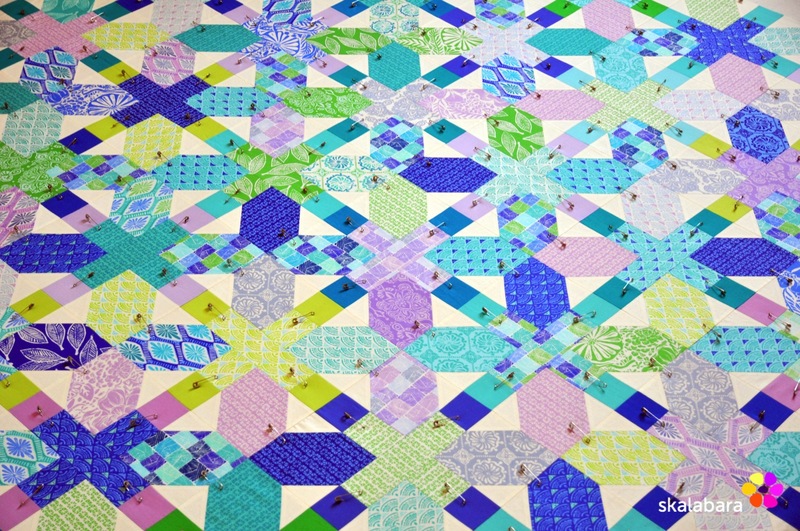 This week I wanted to finish my Avenue Loop quilt, but I wasn’t in the mood to work on a large quilt. Saturday I decided that it is the right time to carry on with work and prepare a quilt sandwich. To my surprise I did not have enough batting. Now I have to wait for another week till the shop opens after holidays. 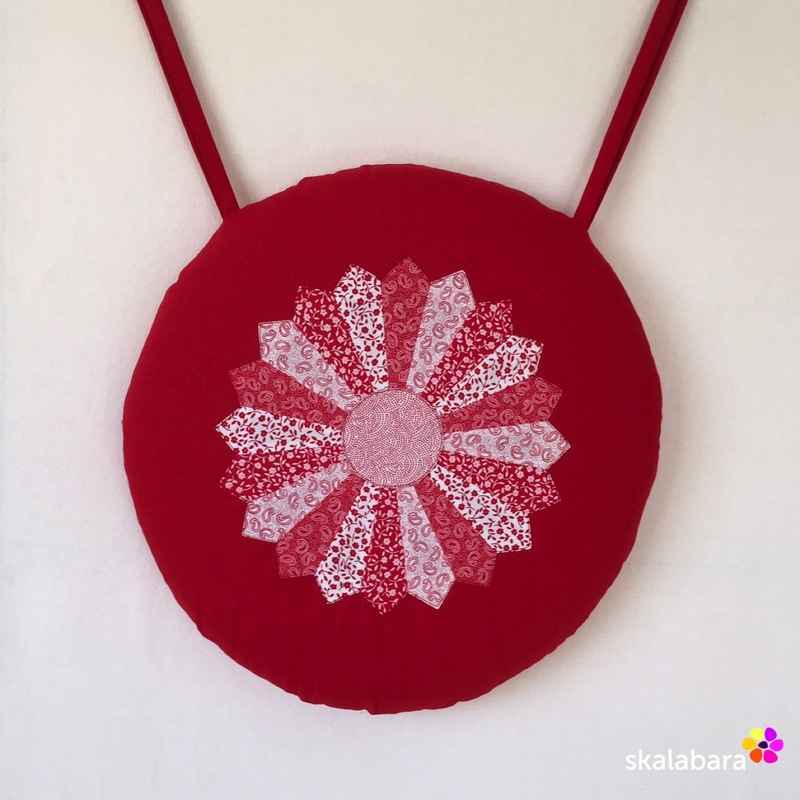 Since I haven’t been on the sewing machine for some time, I really wanted to work and make a smaller project (to fit in my rest batting). 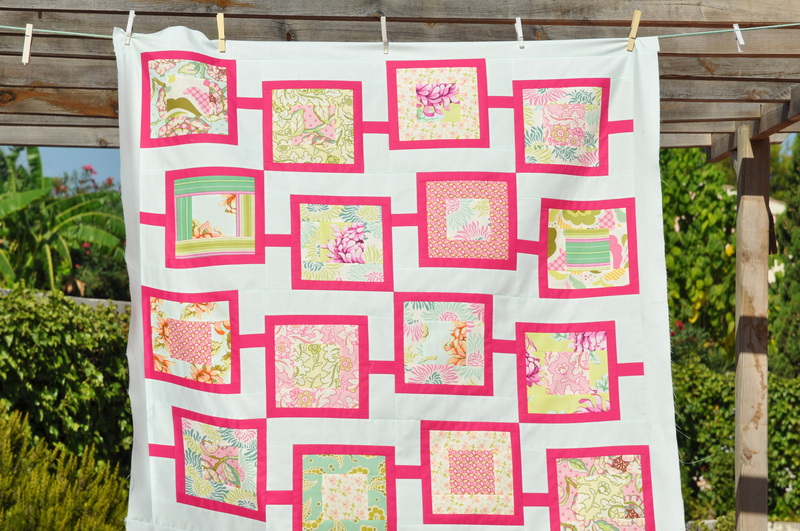 I found a nice quilt tutorial at Hyacinth Quilt Designs called Sanctuary Squares. I downsized it and used fabrics from the collection Freshcut by Heather Bailey. As solids I chose a bright fuchsia and aqua in light blue/green. The top as well as the backing are now ready, tomorrow I shall make the quilt sandwich. I tried to take a photo this afternoon, but we always have wind – so everything was moving. 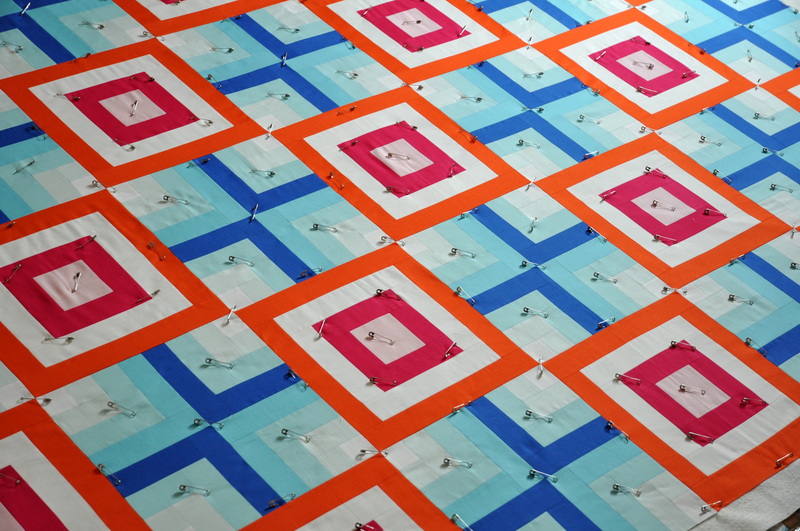 Still thinking about the quilting pattern and I am looking forward to finish it. Anyway, the best part with each quilt is binding (at least for me). And I hope I can bind this one later this week.